This editorial starts with the story of a meeting. 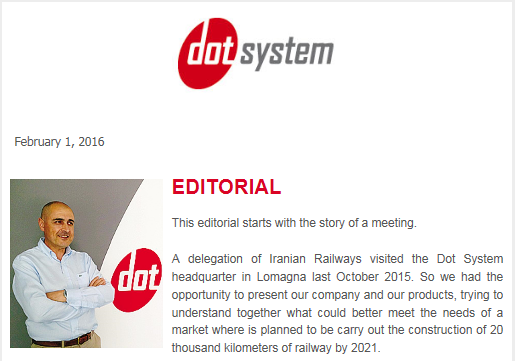 A delegation of Iranian Railways visited the Dot System headquarter in Lomagna last October 2015. So we had the opportunity to present our company and our products, trying to understand together what could better meet the needs of a market where is planned to be carry out the construction of 20 thousand kilometers of railway by 2021. In wider terms we could also learn the great investments expected for the construction of new railway infrastructures in Middle East and Caucasian countries. It was an important meeting for a small company like Dot System, that continues to target new markets. We are at the beginning of 2016, and it is time to take stock of the previous year. The balance sheet is more than positive for many reasons: the success at Eurasia Rail, last March in Turkey, the meeting with the Iranian delegation, new orders and contracts signed in Italy and abroad, which we will talk about later. All these elements make us also confident on this new year. Also because 2016 will be an important year for Dot System. We’ll be in Austria, on February, to meet our other companies of railway sector, in March we will be in Istanbul at Eurasia Rail, and in September we will return in Berlin to attend Innotrans, and our goal will be to repeat the success of the previous edition. I wish and hope that 2016 may be for all of you a year full of satisfaction and success. Thanks to a new contract signed with the Chinese company CNR, Dot System consolidates its position in the Chinese high speed market. The deal calls for the supply of component for Intercity and EMU high speed trains, and it has a value of about 2,5 milion euros. CNR is part of CRRC Corporation Limited (China Railway Rolling Stock Corporation), that has been created on June, following the merger between CNR and CSR. Now CRRC Corporation Limited is a giant with headquarter in Beijing, employing more than 175.000 people. On Behalf of CNR Dot System will manage the development and the implementation of elctronic boards MVB and MVB signal repeatres. In detail, the high-speed trains will be equipped with about 8.000 electronic boards and 600 repeaters, entirely designed and developed in our headquarter in Italy. Dot System will provide to CNR electronics boards and repeaters that allow to manage the communication between control devices and management systems, also enabling the automatic monitoring of redundancy in the event of errors or line break. In early December Trenitalia (Italian national railway company) has signed a contract with Hitachi Rail Italy, founded after the recent acquisition of AnsaldoBreda, the railway company of Finmeccanica Group. The total contract value is 190 million euros. The order regards the constructions of new regional trains Vivalto, which will implement the regional service of Trenitalia. This contract follows the Vivalto coaches already committed in April from Trenitalia to AnsaldoBreda, which is an option of the contract signed in 2010. The supply contract is related to 136 second-class coaches: 112 double-deck intermediate and 24 semi-pilot coaches. The trains will be manufactured in the Hitachi Rail Italy sites based in Pistoia and Reggio Calabria, while components and electronics will be manufactured in the Hitachi Rail Italy site in Naples. Vivalto is the new double-decker train for the local transport of Trenitalia, intended for use with the drive Bombardier E.464, already supplied to Trenitalia fleet. Trains Vivalto run also thanks to Dot System solutions installed on the trainsets produced by AnsaldoBreda and now by Hitachi Rail Italy.